Yusuf Estes, ex-Christian Minister and prominent Muslim Scholar from USA has a beautiful website. About 14 years ago he learned about Quran in Arabic languge. After comparing to the Bible in Greek, Hebrew and English it has become clear to him that they were "originally" from the very same Source - Alaha (the Aramaic word that Jesus christ spoke, which means God) or Allah (which is arabic, a very close language of Aramaic meaning God). 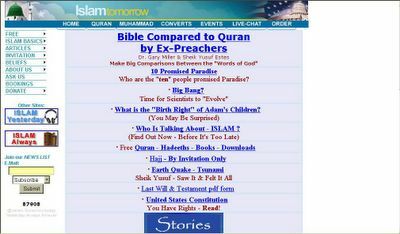 Check this website for Divine Guidance and better understanding of your own religion. (Click above image). May God give us the guidance. Amen.